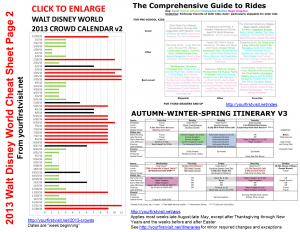 My four-page Walt Disney World Cheat Sheet–an example page is to the right–includes a number of this site’s famous charts and graphs. It’s updated to reflect FastPass+. In total, the cheat sheet provides the key stuff you need for planning your 2014 first family visit to Walt Disney World. Click here to open it as a PDF–it’s 1.47 MB, so might take a bit. 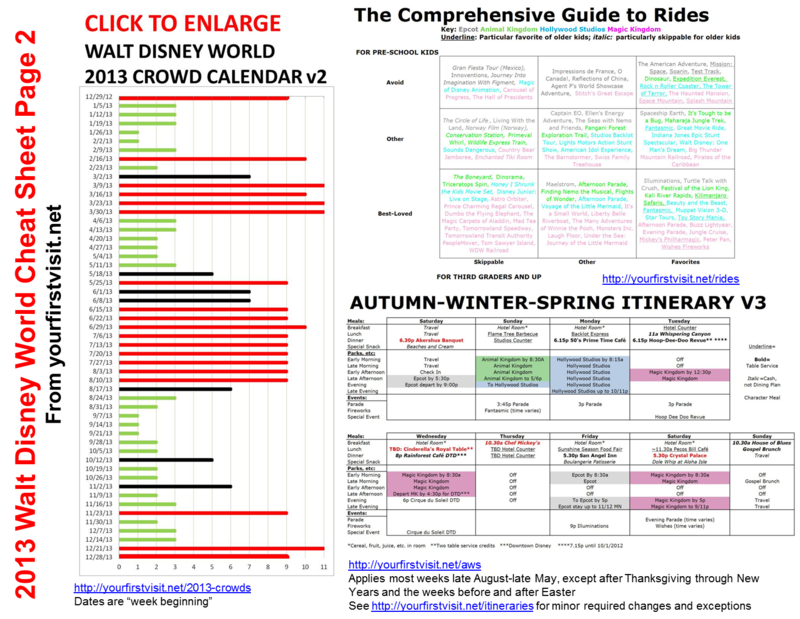 So based on these thoughts and what people pin on Pinterest, I’ve put together the four-page Walt Disney World 2013 Cheat Sheet. Click the link to open up the (1.9 mb) PDF. You can like an individual page by clicking the “f share” button at the bottom of that page. Update June 2010: it looks as though Facebook’s recent privacy mess has led it to stop showing you if your friends like this site. You seem to see only your own name after you like it (and then only if your computer is signed in to Facebook), and not any others. That means I don’t see your name, even if we are Facebook Friends. If you are seeing something other than this–other people besides you–let me know via the comment form below. By the way, there are a few sites that get, or have access to, extensive data from Facebook about you, when you like or share. This one is not one of them!!! I get nothing! Nothing! The FTC has called for better disclosure of any payments or freebies related to reviews for products. The short version is that none has been used in this site, although I have a couple of affiliations noted at the bottom of the page. No free or loaned products or services, special rates offered only to me, or any other such deals have been used in accessing the experiences or formulating the instructions, the recommendations, the rankings, or any other material on this site, the Walt Disney World Instruction Manual at yourfirstvisit.net. All experiences used in this site’s reporting, reviews, rankings, and recommendations have been paid for in cash at rates available to the general public. In the summer of 2010, I agreed to a relationship with Destinations in Florida, so if you use them as your travel agent through a link from this site, I get a little pixie dust back from them. In June 2011–after recommending them for more than 3 years–I entered into a relationship with TouringPlans.com. If you buy one of their paid products through a link from this site, I get a little pixie dust back from them. In November 2011, SellMyTimeshareNOW.com became a sponsor of this site. In September 2013 I entered into an affiliate relationship with Steve Bell around his e-book on Shades of Green, the Armed Forces resort at Walt Disney World. In January 2016, I partnered with Official Ticket Center, so if you buy tickets from them via a link from this site, they spread a little pixie dust back to me. This page presents recommended books. For recommended websites, see this. Ok, I finally got around to buying a Kindle. I highly recommend it, especially for travelers who love to read, or who like guidebooks. You can bring your trashy novels for the plane, and to read while waiting in line, in a much lighter, less bulky, and more convenient format. And if you buy one of the guidebooks below, you can get the Kindle version, if available, and take it into the parks with you! Because you have this site, you don’t need either of the books below. But they are affordable luxuries! Their best use, for families whose visit is largely based on this site, is for the trip home, to pass around and use as aids to memory and discussion of the trip.